There are basically three ways of purchasing bettas. Buying them from a pet store, buying them from a breeder, or buying them online. I'll run through some important things to consider in each of those options. 1.) Buying From a Pet Store If you are new to bettas and in the market for a neat and interesting pet, this is probably where you're going to go. Pet stores and the pet departments of other large chains usually offer bettas in very tiny plastic cups. Obviously these are not good containers for bettas, and very often whatever stock is available is sick, weak, and dying. Without going to far into how I feel about these pet stores that view their livestock as commodities rather than living, feeling creatures, sometimes you can get lucky and find a pet store that has fairly decent stock, either because it is a new shipment or because they actually make an effort to care for their fish. Most of the time, any betta you find in a pet store will be a Veiltail. Sometimes you may see an odd DTVT (doubletailed veiltail) but I think you'll find that most of them will be the singletailed variety. They come in a wide array of colors, including blue, red, green, cambodian, bicolor, pastel, grizzled, and some even have marble or butterfly patterns. Occasionally a pet store may carry HMs and crowntails as well, but these are usually more expensive and snapped up fast. Occasionally I have found a shortfinned plakat male in a pet store, but more often than not these were cases of mistaken identity as the store was selling them as females. I can only imagine the surprise of the customer that tried to set one of these males up with another male for spawning! Because they are available in such a wide variety of colors and types, it is easy to imagine that one could choose a betta to compliment a color theme in a particular room of a house, or just be chosen on personal preference. However, try not to let a pretty color lure you into purchasing a betta that may not be completely healthy. The first thing you should do is pick up the betta in his cup and examine him carefully. The fins should be whole and in good condition, with no tears, jagged or red edges. The body should be clean and free from spots or 'dusting' that would signify a parasite infestation such as ich or velvet. Also look for open sores, white, cottony growths on the fins and body, pale and unusual coloration which could indicate columnaris, clamped fins, 'float' (inability to swim without drifting back to the surface or floating on side), or swim bladder disorder which can cause the fish to swim with his tail dragging, almost as if paralyzed. If the fish checks out, the next thing you should observe is how he reacts to another male betta. Place his cup next to that of another betta and watch what he does. If he flares out his gill covers and spreads his fins at the other betta it is usually a good indicator that he is in good general health. Failure to react indicates illness, unhappiness, or subservience. The last thing you should check are the other bettas in the vicinity. If they are sick, dead, or dying then your betta may have already been exposed to disease. Although I don't think this is enough to disqualify a betta for purchase, you might want to keep him quarantined and watch him for the first week to make sure he doesn't start showing symptoms. 2.) Buying from a breeder. This is often your best bet, and if you live within driving distance of a decent breeder I would highly recommend it. Breeders usually know what genetics their bettas carry, which can prove very useful if you ever decide to spawn your bettas. They also offer young, healthy fish which haven't been exposed to pet shop diseases, as well as many colors and varieties you would never hope to find in a pet store. I know of many breeders who are happy to give tours of their fishrooms to visitors, and this enables you to actually see the fish in person before buying. Look for young, vibrant, healthy fish, and use your own good judgment. 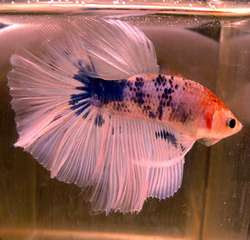 If the breeder does not seem to keep his or her bettas in decent living conditions, you might want to shop elsewhere. 3.) Buying online. This is the best way of getting the highest quality purebred bettas if you are interested in breeding top bettas and possibly even showing them someday. In this day and age of widespread internet use purchasing bettas online is easier than ever. Unfortunately, that also means that there are some sellers out there with shady reputations and business ethics. Look around and ask questions...only purchase from sellers who are willing to answer your questions in a prompt and courteous manner, and who seem educated about their fish. Ask the seller how long he or she has been involved in bettas. You'd be surprised at how many people are selling fish these days who have only been in the betta hobby for a relatively short time -- some of them under a year or two! I'd recommend looking for a seller who has been in the hobby awhile and has sufficient experience in both breeding and selling bettas. Top bettas can also be imported from some of the larger farms in Asia. Asian breeders ship their fish to transhippers in the US, who bring the fish through customs and then examine, feed, and acclimate the fish before reshipping them to you. Very good fish can be acquired this way, but, again, make sure your seller has a good reputation in the betta community. A few Asian sellers I recommend are Bluebetta.com, Siamimbellis.com, Wasanbetta.com, Atisonbetta.com, Nicebettas.com, and Bettatrills.com. 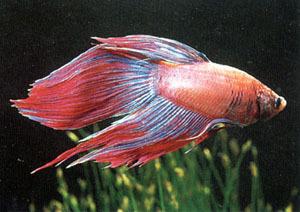 There has been an increased trend recently in importing bettas from the Orient for the purposes of selling within the US. This can be a good way of getting great looking fish at reduced shipping cost, but it has its disadvantages as well. For one thing, bettas purchased from importers are sometimes very weak from all the travelling and acclimating, and are more likely to develop problems such as fin rot, stress-induced tail biting, and reluctance to spawn. Purchasing bettas from importers is also rather a crapshoot, as you don't know what genes they carry and what they will produce when spawned. Most of the large-scale betta breeders in Asia breed indiscriminately as far as color goes, hoping to produce spawns with as many colors and patterns of HM possible to increase the marketability of the total spawn. This means that these fish tend to carry a lot of marble, metallic, multicolor, hybrid, and other genes that influence your spawn outcome. When possible, buy from small private breeders -- but if you can't, just use good judgment. Look for a fish that strikes your fancy, but don't be taken in by sellers who only offer Strain Photos, claiming your fish will look 'something like this'. Bettas are not like other aquarium fish which tend to look nearly identical according to type. There are too many variables which can mean the difference between a quality betta and a substandard one, even if they are technically the same color or type. Always ask to see a photo of the actual fish for sale if one is not already provided. Once you build up a comfortable working relationship with a seller you might learn to trust their judgment enough to pick out a betta sight-unseen especially for you, according to whatever criteria you give them.